Barcelona striker Luis Suarez and Real Madrid's Cristiano Ronaldo were heavily criticised during the opening phase of the season but the two forwards have hit their strides ahead of Saturday's Clasico showdown between the two heavyweight clubs. Ronaldo rifled in the only goal against Brazilian side Gremio to help Madrid lift the Club World Cup on Saturday, while Luis Suarez struck twice as Barcelona thumped Deportivo La Coruna 4-0 on Sunday, stretching their lead at the top of the table. When the bitter rivals meet at the Santiago Bernabeu, Barcelona will be looking to increase their 11 point lead on fourth-placed Madrid, who have played one match less. Madrid's disappointing start to the league season was influenced by Ronaldo's poor form, although he has now turned a corner. The Portuguese scored just one goal in his first eight league games, but has hit form at the right time, scoring eight goals in his last seven matches across all competitions. "Cristiano is Cristiano and you must never doubt him," said defender Raphael Varane after the Club World Cup triumph in Abu Dhabi. Ronaldo, who turns 33 in February, insisted he is responding to criticism with his performances and he is desperate to catch Barcelona at the top of the table. "I hope we win that game so that the league is still alive for Real Madrid," said Ronaldo. "I'm having a great season. I talk on the pitch, I try to give my best so people enjoy my football." In contrast to Madrid, Barcelona are flying. Unbeaten in La Liga and the Champions League, the Catalans made light work of Deportivo in one of their best performances of the season. 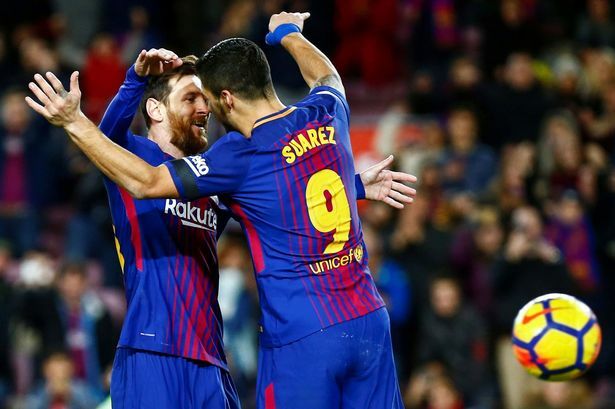 Although the team has been carried by Lionel Messi for much of the season, Suarez was a crucial component of this victory, netting twice, hitting the post and being denied his hat-trick when his rabona shot appeared to cross the line but was not awarded as a goal. "The rabona goal was clear. It went in. I saw it clearly because I was right there," said Suarez, who, like Ronaldo, is only thinking about a Clasico victory. "It would give us a boost in the competition, although there are other rivals like Atletico and Valencia," he added. After a lean spell of scoring two goals in eight games in all competitions at the start of the season, Suarez now has six in his last seven. The Uruguayan's fortunes changed after his national team agreed to give him a rest in November, not calling him up for the international break. With Messi misfiring against Deportivo, hitting the woodwork three times and missing a penalty, Suarez has come into form at the right time.